When pioneers first made their way into the Wild West, land was valuable if it had gold, timber, or other natural resources that created wealth. Though these concepts of land value remain today, the situation has gotten more complex. In short, the way land is treated has become very important when it comes to its value. Why? Because one piece of land has an impact on all the other land (and people) around it. The land also has a future, and making sure that future is a good one benefits everybody, including people who haven’t been born yet. At Texas Acres, we are passionate about creating opportunities for people to fulfill their dreams of owning land in Texas. We are also passionate about ensuring that land remains a viable, valuable opportunity for people of the future. That is why we make sure our buyers understand what they’re getting into, including property restrictions. Property restrictions are created by developers or property owners to preserve the function and aesthetics of land. Restrictions don’t change as the land passes from owner to owner, which is important for creating a cohesive, healthy environment. It’s all about keeping good neighbors and maintaining land value. Most people buy land in the country for the privacy and beauty of nature. At Texas Acres, we believe folks would rather not live next to a noisy manufacturing business, a smelly hog farm, or an unsightly junkyard. That is why we are careful about what commercial activity is allowed next door to your valuable investment. Whether you intend to live on your new property or not, you wouldn’t want your neighbor living in a dilapidated shack. We try to keep our restrictions to a minimum while still protecting you. No one would want their neighbor’s sewage being spilled out on top of the ground, so restrictions guard against that. You may have read the section above and thought, Don’t zoning laws do most of that stuff? If so, you aren’t alone. People often get confused about the differences between zoning and property restrictions. Zoning laws are created and enforced by the government. You could say that zoning laws shape a community on a large scale. Property restrictions function on a smaller, more intimate scale and are created by land owners. They fine-tune communities and help keep them consistent as years go by. 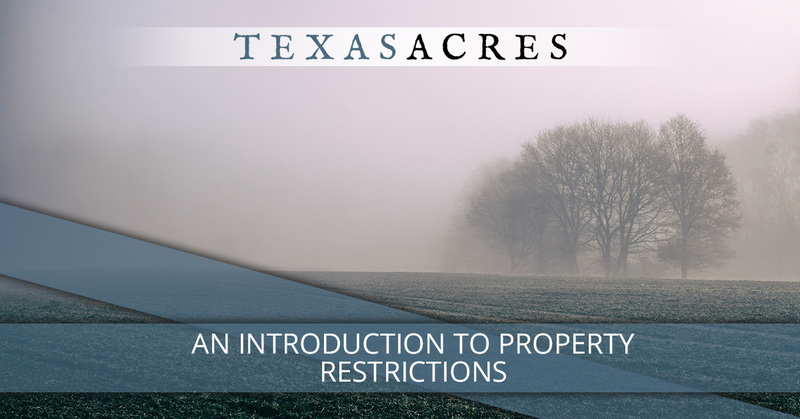 At Texas Acres, it is extremely rare for any of our properties to have zoning laws. Our limited restrictions are geared toward a country lifestyle and help you enjoy your piece of Texas how you see fit while maintaining its value. We understand that obtaining a conventional loan through a bank to buy a home can be easier than purchasing affordable acreage, and that is why we offer owner financed land in Texas. However, we don’t just sell tracts of beautiful Texas property. We also work to educate our buyers so they feel confident and in-the-know. When you want to buy land from a team who will have your back the whole way, it’s time to contact Texas Acres.